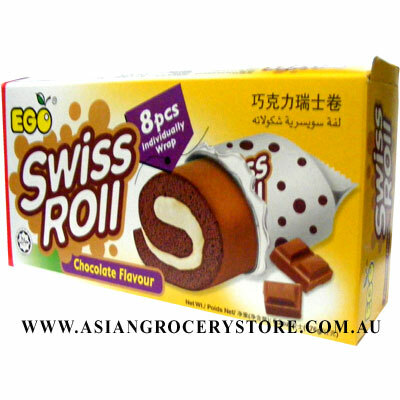 Minimum quantity for "EGO Swiss Roll - Chocolate Flavour" is 1. .Manufactured in a facility that processes Peanuts and other free nuts. Wheat Flour, Sugar, Pasteurizes Liquid Eggs, Shortening, Palm Kernel Oil, D-Sorbitol, Milk Powder, Emulsifier ( E 471 &E 435 ), Margarine, Cocoa Powder, Maltose, Raising Agent (Sodium Bicarbonate E 500 ), Salt, Sorbic Acid ( Preservative ) and Caramel E 150. ( Contains Gluten, Milk & Soybean Product ).